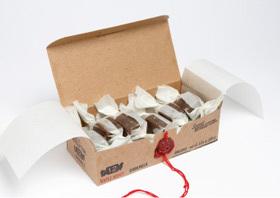 Sweet Revolution Caramels are good to you and not bad for you – in moderation. 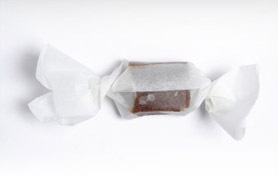 Photo courtesy of Sweet Revolution Caramels. DURING Mercedes-Benz Fashion Week, sometimes food and drink grab some of the spotlight, but not necessarily because a dress is made from candy bars or a blouse is constructed from beer cans. Rather because they are such a nifty idea or a pleasant and welcome surprise. And so it was on several occasions during the New York edition that just wrapped. Erickson Beamon was responsible for one of the most interesting show formats of fashion week. For Spring-Summer 2013, the design team asked the question “Who are You? in a presentation that featured a band seated on the floor playing the same tune in a continuous loop, people in conversation seated on bleachers and silent models conveyed around the space on push carts. While all of this was going on, a makeshift bar in the corner of the Box tent was doing good business with a Pear Cognac infused with pureed organic strawberries and lemon juice. It proved to be a delicious thirst quencher and a good aide for contemplating the question at hand. Macarons are good by themselves or with Champagne. Photo by Yours Truly. Nicholas K, which has kicked off fashion week the last few seasons, left one wondering whether aviation or travel informed the collection. That, too, was a question that could be contemplated while consuming something tasty in the form of the Maple Honey Caramels that were placed in the front-row seats. They are from Sweet Revolution Caramels (htttp://www.sweetrevolutioncaramels.com). Even better news is their pedigree: made from “simple, natural organic ingredients. That is, maple, honey, cream, butter, sea salt, vanilla bean and lemon. Not an additive/preservative or a drop of corn syrup in sight! One of the sweetest treats of all were the macarons set out on trays for any taker during the Fotini presentation. The SS13 collection sought inspiration in the muted colors favored by several 18th-century French painters, including Fragonard. 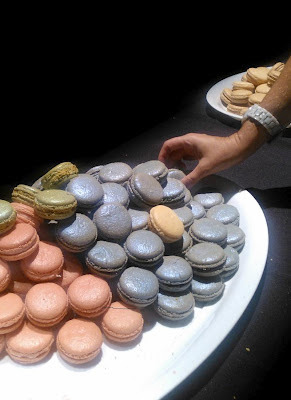 The color profile is butter, sage, soft pink, lavender, taupe and white; ditto for the macarons. Could they have been from anywhere except the Upper East Side location of Ladurée (http://www.laduree.fr/)? The old (left) and new Heineken bottle. Photos courtesy of Heineken USA. THIS one has a longer, leaner neck, more defined shoulders and is slimmer through the torso. Taller, too. This is not a description of the latest It super model but the new design of the Heineken beer bottle The "Star Bottle" is arriving in select venues in New York State this week and will rollout across the United States, commencing in March 2013. It debuted in parts of Asia a few months ago (see video below of launch party in Malaysia) and made its world debuted last year in western Europe. The Dutch brewer, which fashions itself as the leading "upscale" beer importer to the United States, literally wants to be head and shoulders above most others in the marketplace, hence the new design of the 12 oz. and 22 oz bottles. The Star Bottle also sports a feature that is designed to help keep the beer cooler longer. The Star Bottle represents the first change in the design of the iconic Heineken green in more than 60 years. In this changing environment, however, Heineken is hard pressed to stress that one element that has remained unchanged is the taste. 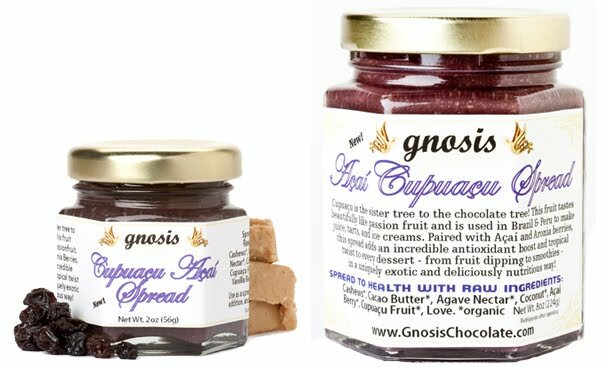 According to company p.r., "consumers can still expect the same smooth, full-bodied beer with a complexity that balances fruity notes with mild bitterness ..."
The Cupuaçu Spread, above, and Aphrodisia are going for a good price at Gnosis. Photos courtesy of Gnosis. 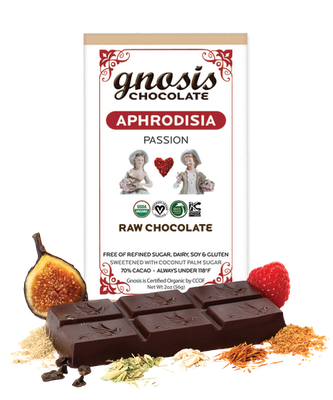 CHOCOHOLICS out there might be interested to know that Gnosis, the chocolatier dedicated to promoting health and wellness, has a deal. Gnosis is doing such a good public service to celebrate the end of summer and the beginning of fall. How nice is that! 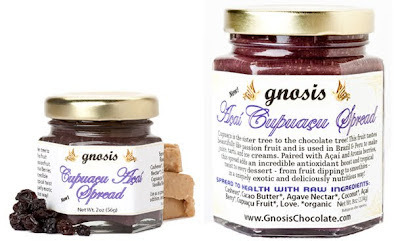 On a totally self-serving note, Gnosis is also repackaging its products. But there are not too many better or nicer ways to move the old to make room for the new, right? All takers can avail themselves of the offer on Reishi Mushroom Extract and anything else by entering code SEPT-25 at checkout. Make it so by 30 Sept., for as has been noted, this deal won't last forever. 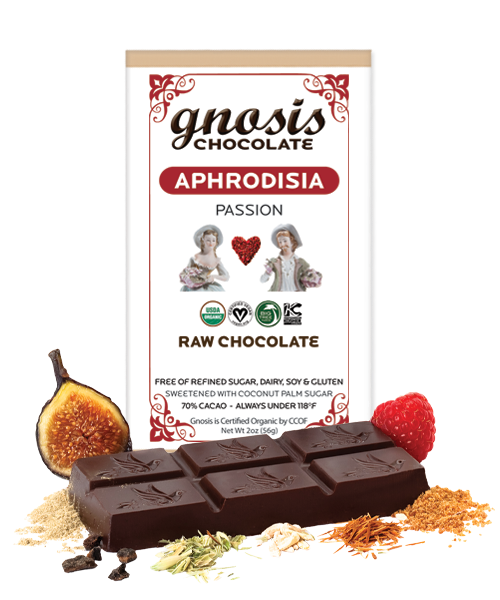 (http://www.gnosischocolate.com).